Between the 2016 and 2017 growing seasons, farms with State Water Efficiency and Enhancement Program (SWEEP) projects reduced their water and energy use by more than 20%, according to recently released results of an ongoing audit of fourteen projects. The results of the audit, which uses remote smart meter monitoring on a sample of the 126 projects funded in 2016, were shared at the March 15 meeting of the California Department of Food and Agriculture’s (CDFA) Science Advisory Panel (SAP). SWEEP provides grants to growers for irrigation management improvements, including increased efficiency measures, soil moisture monitoring equipment, solar pumps and more. SWEEP is very popular with farmers. During the first six grant rounds, almost three times more applications were received than were funded. Since its inception, SWEEP has awarded more than $63 million to over 600 growers in 33 counties. Check out our SWEEP fact sheet for more program stats and profiles of grant recipients. Click on this image to read profiles of four SWEEP grant recipients. The bad news: SWEEP had its budget cut for the current fiscal year, even though climate scientists predict California will increasingly experience “precipitation whiplash,” in which severe droughts will alternate with intensely rainy winters. 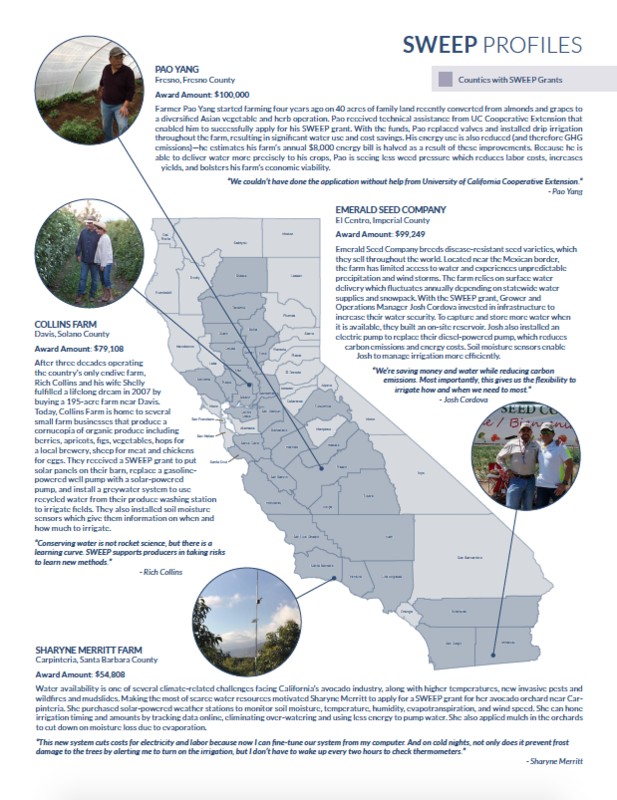 The good news: it’s a new year, which means CalCAN and our partners are back advocating in the legislature and with the Governor’s administration for renewed funding for SWEEP and other Climate Smart Ag programs. The better news: 15 Assemblymembers have signed onto a proposal to restore funding for natural and working lands climate change programs, including SWEEP and Healthy Soils. If any of those 15 (listed below) are your representatives, please take a moment to thank them on social media or by giving their office a quick phone call. Legislators are submitting their priorities for climate investments this week and the first half of next week, so now’s a good time to remind your representatives that their constituents consider SWEEP and Healthy Soils a top priority. Curious to read more about the audit’s methods and results? Click here for the audit presentation from CDFA and PowWow Energy.